Ezra Matthew Miller, popularly known as Ezra Miller is an American actor and singer. He is best known for his roles as Barry Allen/The Flash in the DC Extended Universe films, Batman v Superman: Dawn of Justice, Suicide Squad and in Justice League, as Credence Barebone in the Fantastic Beasts And Where to Find Them and Fantastic Beasts: The Crimes of Grindelwald. His other major films are The Perks of Being a Wallflowers, We Need To Talk About Kevin, Trainwreck, among others. Ezra Miller is one of the celebrities featured on the Palm Casino Resort's new campaign video, "Unstatus Quo". The other celebrities featured on the video are Cardi B, Ken Block, Emily Ratajkowski, Marshmello, Rita Ora, Ozuna, Adriana Lima, Dapper Dan, Ezra Miller, Leticia Bufoni, Ryan Sheckler, Jason REVOK, Felipe Pantone, Timothy Curtis, and Chef Micheal Symon. The Fantastic Beasts star Ezra Miller slides into a purple Gucci X Dapper Dan duffle-style jacket by the fashion designer himself. His role as Barry Allen/The Flash in Batman v Superman: Dawn of Justice, Suicide Squad, and Justice League. His role in The Perks of Being a Wallflowers. His role as Credence Barebone in the Fantastic Beasts films. Where is Ezra Miller from? Ezra Miller was born on 30 September 1991. His birth name is Ezra Matthew Miller. He was born to a father Robert S. Miller, and a mother, Marta Miller. He has German and Dutch ancestry from the maternal side. His birthplace is in Wyckoff, New Jersey in the United States. He holds American nationality. He belongs to White ethnicity. His zodiac sign is Libra. He identifies himself as Jewish. He has 2 siblings i.e. 2 older sisters, Saiya and Caitlin. He attended Rockland Country Day School and The Hudson School. He dropped out of school at the age of 16 after the release of the film Afterschool. He started to train as an opera singer at the age of 6. He trained opera to overcome a speech impediment. He has sung with the Metropolitan Opera and has performed in the American premiere of Philip Glass's opera White Raven. He made his film debut in the role of a teenager at a boarding school in the 2008 film, Afterschool. He was 16 years old. Since then, he has appeared in numerous films including City Island, Beware the Gonzo, Every Day, Another Happy Day, We Need to Talk About Kevin, Madame Bovary, The Stanford Prison Experiment, Trainwreck, among others. His major films are We Need to Talk About Kevin, The Perks of Being a Wallflower, and Trainwreck. His is known for his role as Barry Allen/The Flash in Justice League and Suicide Squad. He first made a cameo appearance as The Flash in Batman v. Superman: Dawn of Justice. He is also known for his role as Barebone Credence in Fantastic Beasts and Where to Find Them. He reprised the role in Fantastic Beasts: The Crimes of Grindelwald. He made his television debut in 2008 where he appeared as Damien Patterson in an American comedy-drama television series, Californication. He later appeared in television series Law & Order: Special Victims Unit and Royal Pains. He is also a singer and sings opera very well. He trained as an opera singer at a very young age. He plays drums very well. What Awards Has He Won? 2011 Hamptons International Film Festival for Breakthrough Performer Award for Another Happy Day. Hollywood Film Festival Spotlight Award, Boston Society of Film Critics Award for Best Supporting Actor, San Diego Film Critics Society Award for Best Cast, and Santa Barbara International Film Festival - Virtuoso Award, all in 2012 for The Perks of Being a Wallflower. Who is Ezra Miller Dating? No reports of Ezra Miller's affair has surfaced yet. However, he is romantically linked with model Erin Urb. He identifies himself as queer. He expressed interest in kissing boys at a young age. He does not identify as a man or a woman. He identifies himself as human. He lives in Vermont. He was charged with drug possession after he was pulled over for a broken light while he was a passenger in that vehicle. Police discovered 20 grams of marijuana in their possession. But the charges against him were later dropped and faced a $600 penalty for two citations of disorderly conduct. He revealed in an interview with The Hollywood Reporter that he had a personal #MeToo experience with a Hollywood producer and a director. He did not identify those persons. He stated that they gave him wine while he was underage and asked if he wants to be in a movie about the gay revolution. 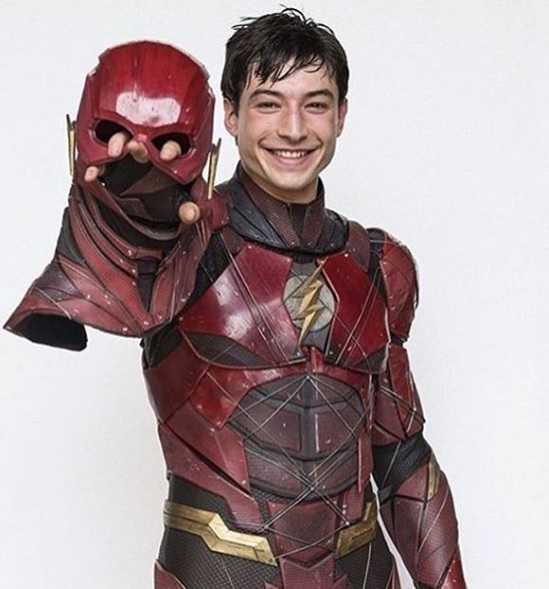 How tall is Ezra Miller? Ezra Miller stands at a height of 1.8 m i.e. 5 feet and 11 inches tall. He has a body weight of 159 lbs i.e. 72 kg. He has a slim body build. He has dark brown eyes and his hair color is black. He wears shoes of size 13.5 (US). What is Ezra Miller net worth? His major earning comes from his acting career. He has worked on numerous films and television series. He modeled a broad range of masculine, feminine, and androgynous style. Working in the entertainment industry is his major source of income. As of 2019, his net worth is estimated at $1 million. His father is Jewish whereas his mother is Christian. His father was senior vice president and managing director of Hyperion Books and later became a publisher at Workman Publishing, whereas his mother is a modern dancer.